World's largest leisure travel company and world-leading global connectivity company team up to create amazing connected guest experiences. MIAMI, April 9, 2019 /PRNewswire/ -- Carnival Corporation & plc (NYSE/LSE: CCL;NYSE: CUK) today announced an expanded relationship with SES (PAR/LuxSE: SESG), adding the world-leading satellite-enabled video and data service provider as a Global Experience and Innovation – Select Innovation Partner. As a Select Innovation Partner, SES will continue to work with Carnival Corporation's Global Experience and Innovation team as an integrated design, development and delivery partner for game-changing guest experience innovations including MedallionClass™ vacations, OceanView® and MedallionNet™ now exclusively available on Princess Cruises. 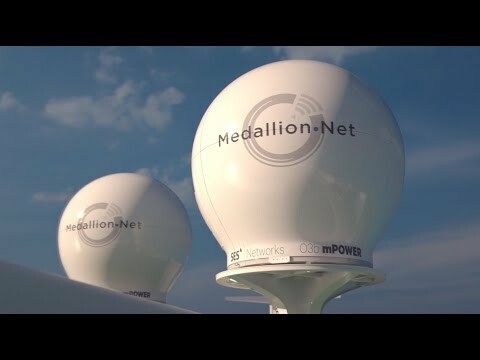 To date, Carnival Corporation's Global Experience and Innovation team with SES Networks, the data business unit of SES, has created MedallionNet, the best Wi-Fi at sea, to deliver connectivity to guests that is fast, unlimited, reliable and affordable. The partnership has also produced the first real-time cruise ship/cloud-scale/shoreside intelligence synchronization model that powers the Ocean Guest Experience PlatformTM – an Experience Internet of ThingsTM network on board select ships from Carnival Corporation's Princess Cruises brand. SES, as a world-leading video content distributor delivering over 8,100 channels to over 355 million homes, is bringing its broadcasting capabilities as an innovation partner GO.TM – a direct-to-digital travel series created by Carnival Corporation. In 2019, 11 new episodes filmed in Cuba, Ireland, Scotland and the Bahamas will be released, celebrating some of the most spectacular travel destinations accessible by cruise ship. The short-form episodes are being created in stunning 4K and will be delivered along with the entire OceanView original content library via SES's geostationary earth orbit (GEO) fleet and medium earth orbit (MEO) satellite constellation. "SES is an integral innovation partner who not only provides world-leading connectivity technology through its combined GEO and O3b MEO constellation, but most importantly is passionate about creating amazing experiences through the fusion of creativity, story, connectivity, media and technology with O3b mPOWER on a global scale," said John Padgett, chief experience and innovation officer for Carnival Corporation. "Our first joint creation, MedallionNet, has already significantly elevated the cruise experience for our guests and crew and is pushing the entire industry to improve connectivity for their guests and crew, no matter where they might be in the world." "With MedallionNet, we helped deliver a new and holistic model that sets an entirely new standard for cruise ship connectivity around the world," said Steve Collar, president and CEO of SES. "We are very excited to be a Select Innovation Partner for Carnival Corporation's Global Experience and Innovation team where we can play a more integral role in advancing the Ocean Guest Experience Platform. By leveraging our unique multi-orbit satellite networks, we are empowering Carnival Corporation to deliver game-changing guest experiences to each and every single passenger." Carnival Corporation's proprietary Ocean Guest Experience Platform, powered by the OceanMedallion™device, is exclusive to Princess Cruises and given complimentary to all guests on select ships to enhance guest-crew interactions and to deliver a high level of service and personalized attention on a large scale. The Medallion enables keyless stateroom entry, hassle-free payment, turn-by-turn shipboard wayfinding, shipmate locator and personalized itineraries; speeds up embarkation; facilitates on-demand services like ordering food, drinks and merchandise; powers anywhere wagering; and more. MedallionClass vacations enabled by the innovative Medallion are currently available for all guests sailing on three Princess Cruises Ships – Caribbean Princess, Regal Princess and Royal Princess. Together, the corporation's cruise lines operate 104 ships with 243,000 lower berths visiting over 700 ports around the world, with 19 new ships scheduled to be delivered through 2025. Carnival Corporation & plc also operates Holland America Princess Alaska Tours, the leading tour company in Alaska and the Canadian Yukon. Traded on both the New York and London Stock Exchanges, Carnival Corporation & plc is the only group in the world to be included in both the S&P 500 and the FTSE 100 indices. With a long history of innovation and providing guests with extraordinary vacation experiences, Carnival Corporation has received thousands of industry awards – including recognition by the Consumer Technology Association™ as a CES® 2019 Innovation Awards Honoree for the OceanMedallion™. A revolutionary wearable device that contains a proprietary blend of communication technologies, the OceanMedallion enables the world's first interactive guest experience platform transforming vacation travel on a large scale into a highly personalized level of customized service. The prestigious CES Innovation Awards honor outstanding design and engineering in consumer technology products. Additional information can be found on www.carnival.com, www.princess.com, www.hollandamerica.com, www.seabourn.com, www.pocruises.com.au, www.costacruise.com, www.aida.de, www.pocruises.com and www.cunard.com.